Once white folk had finally finished settling in American, and only after they’d properly slaughtered thousands upon thousands of Native Americans, they could truly begin defining their musical compositions. Of course, per protocol, they began this by romanticizing those that they had previously eradicated and despised. Music has long since been composed through exoticism and romanticism of the “Other,” but it is brought to a new level when that “Other” is a group that was previously massacred in the place that this new music is now being composed. My Indian Maiden, a beautiful piece composed by Edward Coleman in New York in 1904, is a prime example of this romanticism. He presents in the title a love story between a white man and his “Indian Maiden,” who is presented on the title page of the work as an exotic beauty of incomparable standards. Not only is this in itself problematic, but the music also holds some truly “exotic” melodies and aspects. The piece is written in Em and even in the first bar presents stereotypically Native American musical tones. 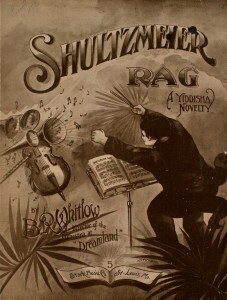 The chromatic grace notes in the top part could be associated to a war cry or horn. The rhythmic bottom line can also be tied to drums or body percussion, as it doesn’t change often and is the baseline of the music. The grace notes continue throughout the piece in the accompaniment to the melody, as well as a repeated e f g f e, highlighting the minor key and the minor third. The lyrics portray a man venturing into a forest glade where a young Native American maiden sits outside her teepee, wearing beautiful beads and awaiting him. He then presents her with trinkets abound in riches and sings his love to her. Eventually, they will be together and all of the tribes will rejoice as they exist in harmony with nature. Of course, these lyrics present a slightly different truth from what truly happened. Music that romanticizes the “Other” has always been present in society, but the levels to which we accept it as entertainment without either knowing the proper story or respecting that it is extremely problematic must be addressed. In children’s books, in shows, and in society as a whole, exoticism and romanticism run amuck in a disrespectful manner, and it must be addressed and discussed, else it will never be changed. 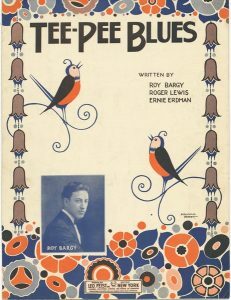 Have you ever noticed that many ragtime tunes sound the same? Listen to the following two clips for their similar harmonic motion/progressions, the similarity in rhythmic syncopation/complexity, and form. Each have a general intro and short repeated sections, which unless you have become very familiar with the tune are very hard to remember. How is it possible that publishing companies could sell something so similar sounding and make it popular? 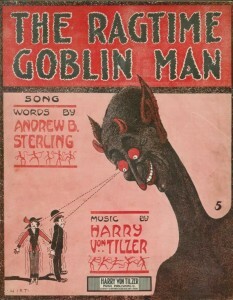 It is clear that the Felicity Rag’s cover draws on minstrel like, simian caricatures, while the Ragtime Goblin Man has an enticing cover with a devil-like character controlling two musicians who according to the lyrics will get caught by the goblin and be made to join his ragtime band. Even thought the tunes’ striking similarity make them seem unmarketable, they have been made unique and sensationalized by their evocative front cover art and titles/lyrics. 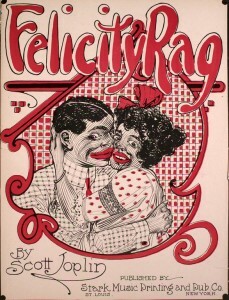 Publishers, composers, and artists who could appeal to the popularity of minstrelsy, the exotic, or the romantic, had successful marketing strategies for popular music. On one hand, it is problematic to have popular tunes, that “represent” different meanings, sound the same because there is a whole lot more complexity to music across cultural/racial/imaginative boundaries. On the other hand, it would be inappropriate to put a minor mode or augmented second in the ragtime tune that is named for Jewish culture or another Other as was done in Schultzmeier Rag, a Yiddish novelty. Now, thinking about today’s popular music, with similar harmonic progressions, rhythmic variations, and subjects, the marketing strategies really haven’t changed that much. When you think about the image sold with the music, whether it is the caricatured lifestyle of a celebrity, or the sensational lyrics, today’s popular music continues these successful marketing strategies at the expense of perpetuating problematic stereotypes.